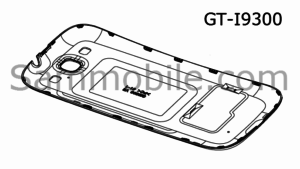 We just received this specifications and sketch of the device from an insider who got it from the GT-I9300 (most likely the Galaxy S3) official Service Manual. 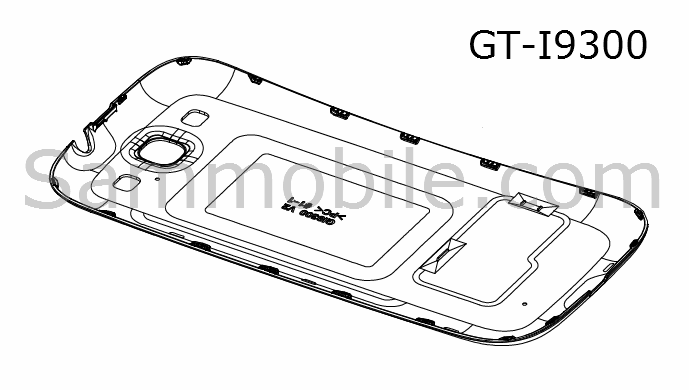 As you can see the Galaxy S3 will sport a homebutton, and will have a NEW type of Super Amoled screen which will measure 4.8″. According this manual the Processor speed is clocked at 1.5 GhZ, which is strange because Samsung introduced today their 1.4 GhZ Quad-Core processor. If you take a closer look at the front of the device you can see a notification-led on the left-side of the front-speaker, this could be due the wireless charging of the phone, which will be the case according the latest rumors. Unfortunatly the camera won’t be a 12 mp according this speclist however this could be one of the first service manuals according our inside. What do you think about these specs? Let us know in the comments below. i think this specs, might be disappointing to me cause i thought at least camera would be 12 MP according to other roamers .but who knows what samsung could surprise us !!!!!!!! Look at the bottom! it will have the S-Pen too, like the Note. Nice! I was thinking of getting a note, but now I’ll definitely wait. Fxx ed up world of amateur phone makers. Like Toyota vs Mercedez, it is not the quality but the price. iPhone is still leading in reality and not by popularity or price tag. Had Apple lower its price to S2, I wonder how many would have difficulty in making decision. Which would you choose? @T1beriu I’m sorry, please forgive me, i didn’t want to offend you with my bad spelling. I’m a foreign citizen and English is not my native language, i promise I’ll do what i can to be better so u can understand me easier, agin, my apologies. Oh man I was hoping a 12Mpx camera. Better cropping and HD video. Yet another disappointment. Also please make 32GB internal phone Samsung. HD games taking a lot of internal space. We need more space. mY NO sPEAK No eNGLISH! Jesus. Get an editor to correct your spelling and semantics before you post. Please. It looks. like a galaxy nexus design…. i hope they are kidding, i hate round corners phones. All these speculations come to an end next week. I think screen bigger then 4.3″ is too big. Is this the final SIII design? 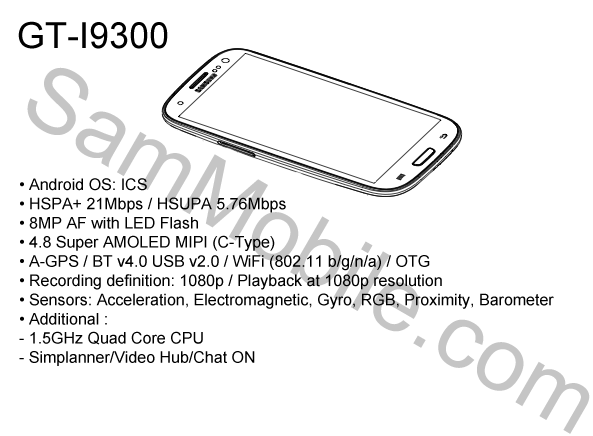 Also it´s mentioned that the Modelnumber will be i9300T ? Samsung CortexTM-A9-core basado en que integra las cuatro de cuatro núcleos AP (procesador de aplicaciones) eksinoseu 4 Quad (cuádruple Exynos 4) es una producción a gran escala. Este producto ha sido lanzado en mayo del próximo modelo montado en la serie Galaxy, pero. 1.4 GHz (gigahertz) que operan a velocidades de más de cuatro de cuatro eksinoseu primera industria de 32nm de bajo consumo de núcleo cuádruple proceso de la lógica AP HKMG aplicada a maximizar la eficiencia energética es un producto.